Stereo, and for co-presenting the M-Net comedy prank show Laugh Out Loud, from 2005-2007.
the Rude Awakening, stand up and corporate events, and television. Darren Whackhead Simpson has worked as far afield as Australia (at Kool Fm) and Heartbeat FM in London. 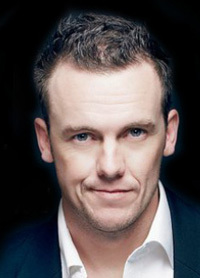 In 2003 Darren Whackhead Simpson appeared on SABC3's Comedy Showcase, and he has also performed in SABC 1's Pure Monate Show. In 2005 he appeared on the first season of Laugh Out Loud, and continued with the show when it was renewed. He is also well known for terrorizing unsuspecting victims with his "Whackhead" phone pranks. In April 2008 he began presenting the M-Net show Clipz, which highlights whacky videos making the rounds on the Internet. Book Corporate Entertainment - We have South Africa`s TOP Artists. Hire a Comedian - Master of Ceremonies - Live Bands - Dance Acts, you can even Hire a Magician - We have the very BEST in Live Entertainment for your function or event.